CoLab Radio » Blog Archive » Listening to the Streets: What sounds do vehicular traffic mask? Listening to the Streets: What sounds do vehicular traffic mask? This is the second post in a series investigating vibrancy in LA through listening to the streets. You can see the first post here. Boyle Heights Mural. Photo Credit: jondoeforty1. By understanding the periodicity of traffic noise, we can uncover the rhythmic aspects of the sonic experiences of this location. In order to identify the sonic qualities of passing vehicles, I’ve taken a two-pronged approach of listening to the sound and visualizing it in a sonogram (sound spectrogram)—a plot of the frequency information of a sound over time. I’ve used the Raven Interactive Sound Analysis software developed by the Cornell Lab of Ornithology Bioacoustics Research, to help identify and analyze the changing patterns in vehicular traffic sounds. In the same way that light is made up of component colors (wavelengths) of the visible spectrum, which can be viewed individually by using a prism, sound is made up of combinations of individual frequency components ranging from low to high. Like a prism, a sonogram allows us to see all of the individual components that make a sound, representing three dimensions of data: time, individual frequency components of sound, and the loudness (power) of those frequency components. The horizontal axis represents time (in seconds), the vertical axis represents the frequency range of the sound (in kHz), and the colors represent the loudness of each frequency component. For reference, this site from Columbia University provides a more detailed explanation of sound and loudness. Sounds of a vehicle driving generally consist of the sound from the engine, tires on the pavement, and wind. This group of sounds take up virtually the entire frequency spectrum, and fades in and out as the vehicle passes the recording position. Louder frequency components are represented by a brighter color, i.e. neon green in the above example. 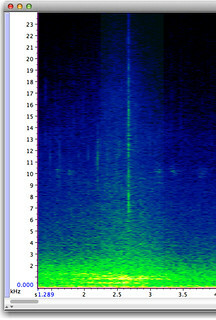 I extracted the above sonogram from our field recording. 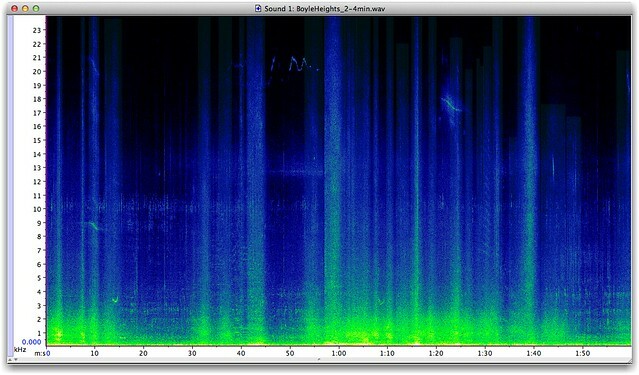 The vertical line in neon green indicates a moment when a vehicle passes our recording site. The visual form of the sounds of individual passing vehicles becomes identifiable after listening to these sounds while looking at the sonogram. Raven provides information about each passing vehicle’s timing and duration. I used Raven to isolate passing vehicles as sonic events. Analysis of the recording shows 30 instances of passing vehicles. The unit of comparison indicated in the chart below is a single sound event, the duration of either a single passing vehicle, or multiple vehicles without a discernable break between them. This analysis nuances our understanding of the sensory experience of the streets. It tells us how much our aural experience is dominated by sounds of vehicular traffic. In this 2-minute recording, over half of our time (55%) is spent listening to passing cars! Additionally, the duration value of passing vehicles can provide a point of reference for the rate at which the vehicular traffic flows. This information may be useful for urban planners and organizers to understand the impact of street infrastructures like traffic signals on pedestrians and cyclists especially as they consider design elements related to safety, flow, and street intersections. Knowing that our aural experience is dominated by vehicular traffic sounds, I decided to make a vehicle-free version of our 19-minute field recording by removing all moments that include vehicular traffic sounds. For the sake of continuity, I left out moments between vehicles that were shorter than 3 seconds. The resulting recording is only 2:37 long, which demonstrates just how prevalent vehicular noise is in the neighborhood. Through this recording, we can imagine a sonic landscape of the streets in Boyle Heights absent of the sounds of cars, buses, trucks, and motorcycles constantly passing by. (Air traffic, including planes and helicopters has not been removed). This virtual soundscape provides a model for an augmented reality app that I would eventually like to create–one that removes the sound of traffic in real time. 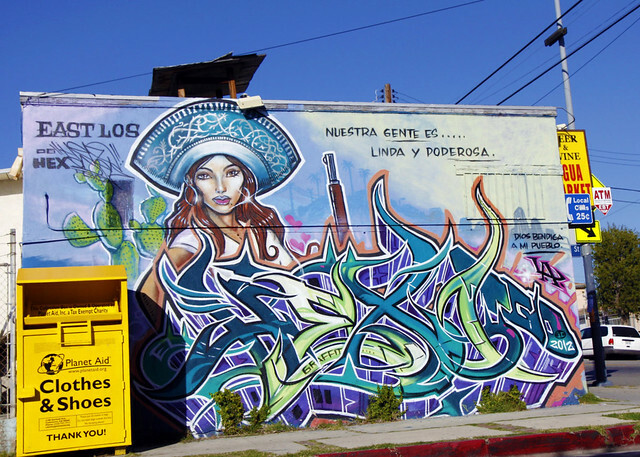 In the next and final post of our blog post series, Wendy will take us through a soundwalk with a community expert through Boyle Heights, to explore the political and economic significance of neighborhoods sounds in social contexts. Steven Kemper is a composer of acoustic and electroacoustic music and a music technologist who focuses on interactive technologies and robotics. Fascinating and inspiring … “Ornithology Bioacoustics” – an interesting idea to use this for traffic noise identification. More ideas come to mind immediately: how different would traffic sound in cities in the Philippines or China or Vietnam or Myanmar where lots of rikshas, motor scooters, bicycles are the norm, or Moscow, where the oligarchs sometimes get permits to use blue emergency lights and sirens to get ahead of commuter traffic. As for “subtracting” the traffic noises from all other bustling sounds in such a city: since traffic though shapes the movements of all other people (i.e. no one crosses a road in front of a speeding car etc.) it would be interesting to see (“hear” rather) how that soundscape changed if, e.g. due to an oil shortage, all cars were actually prohibited from running. I am convinced people would “sound” completely different then. After all, automotive traffic is a constant aggression, not only acoustically.